It’s rare to find a comic filmmaker whose visual style is an important part of his or her process. A few of the masters used framing, camerawork, and editing to showcase their humor, most notably Buster Keaton and Jacques Tati. But even some of the undisputed masters of movie comedy, from Billy Wilder to Woody Allen, have simply concentrated on situation and characterization, and put the camera wherever was most appropriate to accentuate the dialogue or physical shtick. 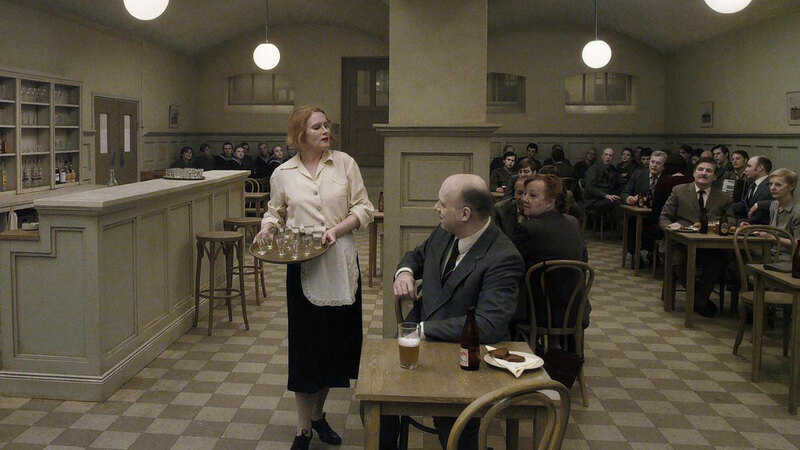 Swedish filmmaker Roy Andersson, whose latest film, A Pigeon Sat on a Branch Reflecting on Existence, screens Wednesday, September 16 at Squeaky Wheel, harkens back to the work of silent-movie comedians and Tati by carefully framing every shot in his films. He in fact goes the comedy gods one further by making each scene in his films into a vignette that takes place in a single shot. Rarely does his camera move, but we “get the picture,” since he makes certain that all we need to see is contained in a single frame. I spoke to Andersson earlier this year when Pigeon, the finale of a trilogy begun with Songs from the Second Floor and You the Living, was about to open in Manhattan. His sense of humor can be especially dark at times, and his dramatic moments run the gamut from heart wrenching to openly grim. But in person he’s a chuckling, avuncular sort who loves to talk about his films as much as he loves to praise his varied influences. He notes with some pleasure that Pigeon is his most “hopeful” film to date. (His theatrical output has been very small—he has made only five features in 45 years of filmmaking.) He also emphasizes that he perfected his “all in one shot” visual style while working on his TV commercials, renowned by no less than Ingmar Bergman, which can be seen on YouTube and draw heavily on the pacing of silent comedies. Andersson is quick to credit his influences, most of whom are painters—thus explaining the importance of framing in his films. He notes that Pigeon got its title from a work by Bruegel in which birds watch over mankind’s activities. He also cites Otto Dix and Edward Hopper as the source of sequences in the film, the former because of his grotesque imagery and the latter for the briefer moments where characters simply take a break from daily life. And he gives high praise to Tati, Laurel and Hardy (inspiration for a pair of traveling salesmen in Pigeon), and the inimitable Luis Buñuel.